I hope that many of you are familiar with Shekinah, the outspoken, comedic, hairstylist and friend of Tiny Harris on TI & Tiny's Family Hustle! She is one funny cookie and has moments that sometimes take over the entire show. While doing a little research I noticed that the infamous EXCLUSIVE blue with light designed print, form fitting dress from @28Boutique (on twitter and instagram) is similar to a piece recently worn by @ShekinahJo (on twitter). 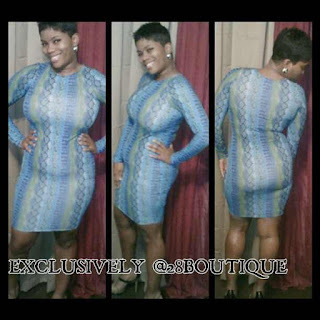 If you happen to like Shekinah's style and want the look or just like the dress anyway because it is SUPER BAD, shop28boutique.com limited quantities and sizes are remaining!